Max Fournier is an all-star goalie for the Carolina Cold Fury. He can have any woman he wants and there are several willing puck bunnies who would rise for the challenge. The only thing on his mind at this moment is winning another championship. He’s worked hard to overcome an injury that affected his ability to play a few seasons ago and now that Ryker Evans has retired, he is once again the starting goalie. He has never been able to have a successful relationship, but, he meets this woman that he just can’t let go of. He wants to be with her, but, he is not confident that he can give her what she needs. When his celebrity status doesn’t impress her, he realizes this will be his hardest pursuit ever! He’s good at stopping the puck from entering the net, but, how does he stop his bad track record at relationships from ruining his chance at love?Evangeline Morrissey is smart, pretty, and dedicated to research. She doesn’t have an exciting life, but, she is well traveled and uses her travels to explore the world. While on such an excursion, she becomes a witness to a murder that she has no idea has taken place. She was simply in the wrong place at the wrong time. A handsome stranger asks her to dinner, she is hesitant and for good reason. Who would’ve thought that dinner would turn into a life changing event? I love the Cold Fury Hockey Series! All the Alpha Males have unique personalities and their background story is very enthralling. Some of the romantic scenes are repetitive and mirror the previous books. However, they are still hot and never fail to please. This series has only 2 more books in the series. I could read about these hockey players every day! I really loved this read! Overcoming fears of the unknown and dealing with someone from the past that threatens to rip everything apart always makes a great story. 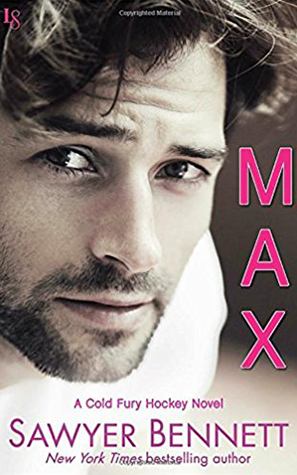 Max is dealing with feelings that he’s never felt before and Jules doesn’t believe that Max can handle her complicated life. These two are made for each other and this is a sweet story of fight or flight love! Solid 4 Stars!